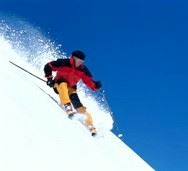 Downhill skiing has been one of the club's primary activites for some 50 years now. Our club is blessed with many local mountains - all within 45 minutes drive. In fact, we have set up a "Club Ski Night" with special lift ticket discounts for club members at Labrador, Toggenburg, and Song Mountain. And if skiing in Vermont interests you, members can stay at the ski club lodge, located in Central Vermont, while visiting such areas as Sugarbush, Jay Peak, Killington, Pico, Stowe, etc. Special discounted lift tickets to many of these areas are available to club members. Club sponsored ski trips also provide members with the opportunity to ski inexpensively at many top resorts in the East and West. See dates for the Club's Sunday NASTAR racing at Labrador and the OSC Cup Race on the Club Calendar.